Hey - putting on this event isn't easy. Paying for all the expenses isn't easy either. There are lots of requirements, fees and equipment that make up putting on the Rescue Roundup. Without the support of our great sponsors, we would not be able to bring this event to you. These companies and businesses have generously donated to the cause of rescue and we thank them for the community spirit that they inspire. WOW!!! A huge Thank You to our Gold Ribbon Sponsors. They have contributed a substantial amount to help us with the 12th Annual Rescue Roundup. We appreciate the support they have shown us throughout the years. Please visit the booths of our Gold Ribbon Sponsors. ﻿Check out this serious ride! Yes, you and your best friend(s) can take the ultimate ride to luxury vacation at Cinder Hills! 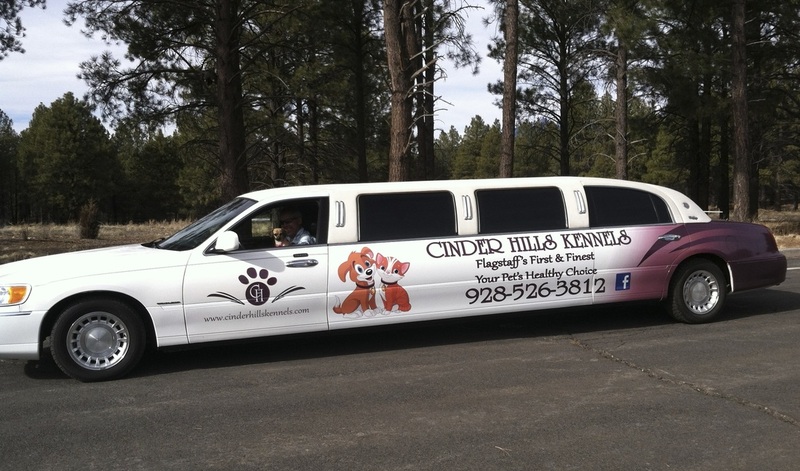 You could say that Cinder Hills is Flagstaff’s oldest AND newest dog and cat boarding facility! Located east of Flagstaff on 5 acres, our kennel consists of 42 indoor/outdoor doggie dens, 14 outside doggie play pens, the largest kennel exercise yard available in Flagstaff, as well as a cat facility that we call our Purring Parlor. Our dens are up to 80% larger than others' advertised space (72 vs. 40 square feet)...and up to 360% larger during high accommodation periods (72 vs. 20 square feet) because we do not reduce the size of our dens during such times! All outdoor portions of the dens are covered to maximize the comfort and enjoyment of our campers! Our facility is heated and cooled with 6 different zone controls to ensure each of our guests are comfortable. Skylights and windows throughout the facility ensure natural light that is easy on the eyes. Our conventional lighting consists of pet friendly bulbs that are more suited for animals. Music is piped into our kennel 24 hours a day! For more than two decades, Canyon Pet Hospital has strived to maintain our practice as the premier veterinary hospital in Northern Arizona. To that end, we are committed to providing you and your pet with the highest standards of medical care and customer service. To ensure that your pet receives the best that modern veterinary medicine has to offer, we built a beautiful, 14,000-square-foot veterinary hospital in 2004. Our facility not only provides a warm and welcoming home for the care of your pet, but is also equipped with the most advanced, state-of-the-art technology available. We also understand that having outstanding resources is of little value unless placed in the hands of experienced, talented and compassionate medical professionals. Our doctors and staff meet high standards when it comes to their professional credentials. They are also expected to continually expand their medical knowledge through regular continuing education and keeping abreast of the latest advancements in the veterinary field. We are obviously proud of our facility, resources and people, but we also know that being the premier veterinary hospital in Northern Arizona requires superior client care. We are pet owners too, and we understand how important it is to you that your pet receives care within a friendly and welcoming atmosphere where your questions and opinions are respected. We believe that a smile and a friendly hello as you enter our facility means a lot along with our ability to help protect the health of your pet. In all, we are very proud to be the premier veterinary hospital in Northern Arizona and enjoy our reputation for the quality of our veterinary care as well as the honesty and integrity of our practice. We look forward to helping you maintain the wellbeing of your pet. Our wonderful Blue Ribbon Sponsors have also contributed greatly to the Rescue Roundup. A big Thank You to these community minded companies. Wags and Whiskers Pet Resort is a premier facility for dog and cat boarding. We also offer indoor/outdoor doggie day kamp. They will receive personalized attention and care from our experienced pet techs. Wags and Whiskers is the only pet boarding facility within the Flagstaff City limits. Located 2 miles east of NAU off of Old Route 66. The reviews are in! This is the best place in town....You are welcomed with a Smile and everyone is treated like long time friends,Just a VERY nice clean home town bar. Check out the Corner Cafe right next door for some yummy, yummy food! Our awesome friends that support the Rescue Roundup are back! They provide the cool t-shirts we give to all our volunteers. Connie's design above will be on this year's tee's. We thank Linda and Pete for giving us a great deal that makes our event so special. Connie Townsend is a renowned artist that lives in Flagstaff, AZ. She is best known for her whimsical painting of dogs driving classic cars and trucks. Ever notice how when you leave your dog in the car to run into the store (probably to buy a 40lb. bag of dog food) you return to find your dog sitting in the driver's seat? And then you're at home, say working on the computer, and you hear this "wuh,wuh, wuh, wuhoof" (sound of car starting) coming from your napping dogs lips, and their tail is sorta twitching or wagging and their legs are moving (clutching and shifting). I think they are dreaming about driving that car. My paintings are dog dreams. I know they can't drive. Really. It's the dedication year after year from these companies and individuals that really makes them stand out. Without their support to Rescue, we wouldn't be able to help so many animals find homes. Thank You to our Red Ribbon Sponsors! Novakinetics manufactures parts for aviation OEMs and completion centers, working to customers’ drawings and specifications. Our quality management system is AS9100 certified. We can assist with design, engineering, and qualification of new products.Novakinetics has helped clients get legacy parts and assemblies back into production, through a combination of engineering support, FAA certification support and quality manufacturing. We have also produced aviation ground test components as diverse as wind tunnel models and engine test bellmouths. Northern Arizona Airsoft Network is a group of airsoft enthusiasts that promote fun, safe games, forums,and education. Each year they support various non-profit organizations as a contribution to our community. 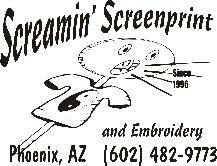 Northern Arizona's Only Premiere Pet Resort that offers 24 hour animal care! Open Monday-Sunday from 6 am to 6 pm and OPEN on ALL Holidays. Thanks to Pepsi For Our Banners Again This Year!